This argument, together with its theoretical background and practical ramifications, was clearly explained by Neri Oxman in her inaugural piece for the Journal of Design and Science . The author was positively influenced after reading Oxman’s article and felt compelled to make his own contribution with regard to her proposed Krebs Cycle of Creativity , but focusing instead on the integration of art with science. As scientist now turned into multimedia artist, the author felt his contribution could provide a valuable take on the topic. The ideas the author expresses here intend to codify the types of creative expression that may lead to the integration of art with science in the near future. The time has come for the emergence of a new science in which creative expressiveness is part of the research agenda and this essay aims at inoculating scientists with the spirit of art, and artists with the spirit of science. For a realistic integration of both disciplines a new framework must be developed that takes into account the affordances (and uncharted opportunities) of each activity as well as their projected point of convergence. Overall, the author has identified six domains in which the disciplines of art, science, engineering and design normally operate (Fig. 1); and for the purpose of this essay they constitute the ‘terrain’ or ‘space’ available for cross-disciplinary work. They are: creation; transmission; artificial; natural; perception; and knowledge. Each of these domains have a defined set of characteristics that the author took into account when explicitly thinking about achieving a successful integration of art with science; and for this reason, it is important the author explain them here in detail. Fig. 1. 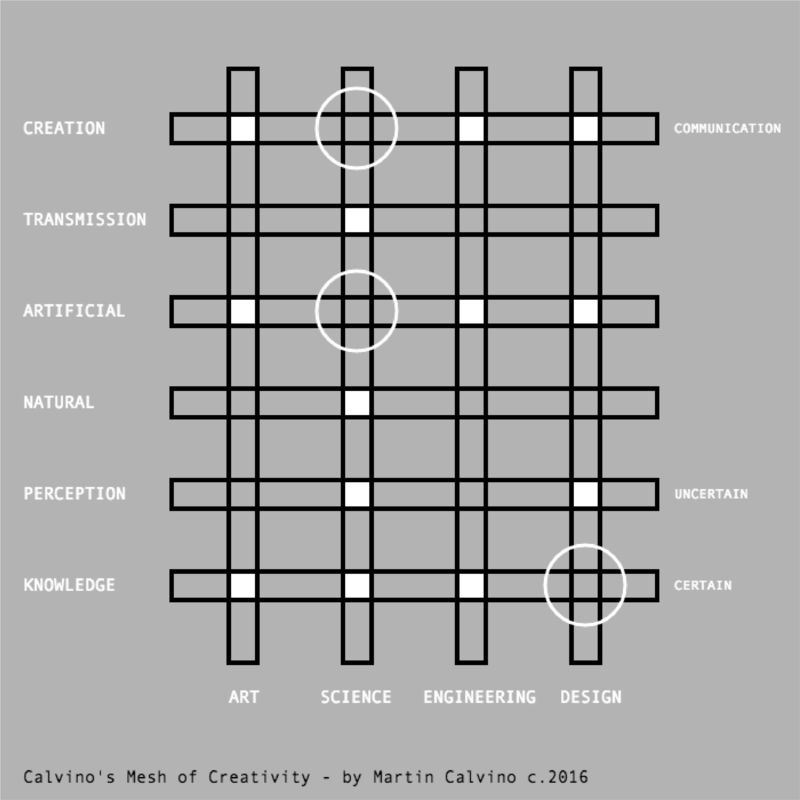 Calvino’s mesh of creativity depicting the intersection of art, science, engineering and design with the six domains of human exploration. In contrast to Oxman’s diagram , the author has placed art in the creation domain instead of under perception. Co-existance of disciplines within a given domain is shown as a white square. The absence of ‘science’ in the creation and artificial domains is shown by white circles. The fields of synthetic biology, genetically modified organisms and artificial selection and breeding are gradually bringing science to co-exist with art, engineering and design in the artificial domain. The creation dimension concerns to the material or physical manifestation of thoughts, and constitutes the domain where ‘the thinkable is expressible’. In this particular context, creation is synonymous of communication because thoughts, which are of an intangible nature, are communicated to the world when expressed in its physical and/or digital equivalent. Artists and scientists approach creation from different angles; for instance, scientists mainly create to test hypothesis that aims at explaining a particular phenomena or process in the natural world. On the other hand, artists create without the implicit intention to test a pre-conceived notion of the natural world. The transmission dimension is concerned with dissemination of thoughts and things created by others. Transmission is the relay of information within and across generations; and culture belongs to this domain. Artists and scientists disseminate their output in quite distinct ways; with scientists mainly relying on peer-reviewed scholarly publishing as means to communicate findings but also to provide enough information for the community to replicate and validate those findings. It would be inconceivable for artists to replicate the artwork of someone else with the sole purpose of validating the findings claimed by the author of the original art piece. The author has defined the artificial domain as containing anything that isn’t natural; whereas natural is the domain concerning the world that hasn’t, isn’t and won’t be created by humans. The artificial vs. natural dichotomy is approached quite differently between artists and scientists. A priory, one would consider the creative result of an artist as artificial whereas the activity of scientists aims at understanding the natural even if they have to create a dysfunctional version of it to elucidate the intricacies of the subject study (think about the creation of mutant organisms in biology for instance). Perception in this work is defined as how humans sense the world around them and determine their behavior towards it. Perception changes with experience and thus is time-dependent. Perception involves interpretation and thus is subjective and uncertain. Artists embrace perception as creative force in their practice, scientists on the other hand try to minimize any perceptual bias that can mask the underlying process. Because truth can only be known, only perception involves partial awareness. The concept of partial awareness is exemplified in the garden of the zen temple Ryoan-ji in Kyoto (Fig. 2), to which the author had the fortune to visit while he was living and studying in Japan. The garden is composed of fifteen stones of different sizes that are arranged in five groups: one group of five stones, two groups of three, and two groups of two stones. The stones are surrounded by white gravel and there is no vegetation in the garden except the moss around the stones. The garden is to be viewed from a seated position on the veranda; with the stones placed so that the entire composition cannot be seen at once. When looking at the garden from any angle, the stones are arranged so that only fourteen of the boulders are visible at one time while the fifteen stone always remains hidden from the viewer. Tradition says that only through the attainment of enlightenment would one be able to view the fifteen stone. The garden was built around 1450 to 1473. When reflecting about Ryoan-ji and comparing it with the pursuit for removal of perceptual biases in science, it is interesting to note that science itself has experienced the paradoxical realm of nature at the particle level, where there is no certainty, only probabilities and statistical conclusions as it was formulated in the Harmonic Theory developed by Norbert Weiner , and the Uncertainty Principle established by Werner Heisenberg . At the particle level, the fifteen stone always remains hidden! The above concept brings the author to knowledge, the domain concerning the search for certainty as to know is to be certain. Thus, knowledge becomes then the search for true perception. How does artistic practice and scientific research traverse the six domains explained above and where do they intersect? Furthermore, in which of these domains could a fertile ground be found for a prosperous integration of art with science? The author explains here that in contrast to the placement of art in the perception domain as it occurred in the Krebs Cycle of Creativity exposed by Oxman , the author placed art in the creation domain instead. By placing art in the creation domain, it is released from the constrain of time, so characteristically associated with perception. Indeed, Joan Miró had expressed “Time? Time doesn’t matter”, suggesting that imagination transcends time and creativity is outside time [4,5]. He described his art as “self-exteriorization force”. Interestingly, and along the same line, Wassily Kandinsky once expressed “The matter of art is beyond time”, who described his art as the product of “inner necessity” . It is clear then that many artists consider the product of their artistic activity as timeless (note: this is not the same as saying that the time at which the artist creates – its social and cultural circumstances – does not have an influence in the way the artists bring their art output forward). Art also intersects the artificial domain because the product of creative expression is derived from thought processes and when it reaches true perception it also intersects the domain of knowledge. Art can then be intersected at the creation, artificial and knowledge domains. So where does science stands in relation to creation, artificial and knowledge domains? As the pursuit of scientific inquiry fluctuates between the domains of perception and knowledge it can’t intersect art in both at the same time as perception and knowledge ultimately exclude each other. Because science is concerned about the natural world and has as one of its main activities the transmission of information; from the diagram shown on Fig. 1 we can observe that science is absent from the creation and artificial domains in which art, engineering and design already co-exist. This means that for science to effectively ‘bridge’ into art, engineering and design, it has to transit through the creation and artificial domains. Efforts in the field of synthetic biology, genetically modified organisms, and artificial selection and domestication are clear examples of science transiting towards the artificial, were it started to co-exist mainly with engineering and design disciplines, and in a lesser extent with art. How can science and art be brought together under the creation domain? The author proposes we follow the steps that the inventors of abstract art took during the early 1900s. We need to liberate science from its current form. (1) Use of art to display patterns found in data to communicate in visually engaging forms; Data art is perhaps the most practical manner for fast integration of art with science and is currently taking off. However, data art should aspire to become more than just information visualization, it should appeal to the emotions of the viewers the same manner traditional art does. (2) Use of art as complimentary mechanism to communicate scientific findings to mainstream society; This is perhaps the most exciting possibility for art to be integrated with science. The way in which art is communicated can greatly help science outreach. For instance, art exhibitions and performances can be created around key scientific findings that needed to be communicated to society at large in non-scientific forms. The monetary proceedings of such events can provide additional sources of funding for furthering scientific and artistic research. Scientists then should reach out to artists in order to create non-traditional avenues to communicate and fund their research activities. (3) Re-structuring of academic departments and science laboratories to incorporate artists; In the same way principal investigators hire laboratory managers, they could hire artists and communication managers to conduct artistic research on how to portray findings in non-scientific manner that can be accessible to society at large. This without doubt would widen the impact of science and will bring it closer to people. Imagine such an approach to help communicate with artistic sensibility the scientific research behind genetically modified organisms (GMOs), a topic of great tension that involves actors in academy, industry and society. Art used in this manner will inoculate science with greater appeal and capacity for understanding from the general public. Scientists should open up and be brave enough to change the same way the inventors of abstract art did! Martin Calvino is fascinated with the use of computers as an expressive medium. He aims at applying coding and visual aesthetics principles to create engaging and meaningful artworks. He is currently artist-in-residence at the ‘Art and Artificial Intelligence Lab’ at the Computer Science Department of Rutgers University. He was a Senior Research Assistant at the School of Creative Media, City University of Hong Kong; and previously attended the Interactive Telecommunications Program (ITP) at Tisch School of the Arts, New York University. He holds degrees in Plant Molecular Genetics from Rutgers University (PhD) and Tsukuba University (MS), and in Molecular Biology from the University of the Republic of Uruguay (BS). He conducted studies and works under the sponsorship of prestigious fellowships such as Fulbright (USA) and Monbukagakusho (Japan), and in 2012 received the Eileen Brennan Graduate Research Award from the department of Plant Biology & Pathology at Rutgers in recognition for his scientific output. Martin’s interest and work focuses on the integration of Art & Science, New Media Art and Tango, and artistic applications of Machine Learning and Artificial Intelligence.